WASHINGTON – As news outlets continue to report on whether embattled White House chief strategist and white nationalist Stephen Bannon will continue serving in the administration, 23 diverse civil rights groups are reminding the Trump Administration that governing through Bannon’s divisive and hateful campaign style is out of step with the country. “Stephen Bannon has built his political career on vilifying people of color, women, religious minorities, and the LGBT community. 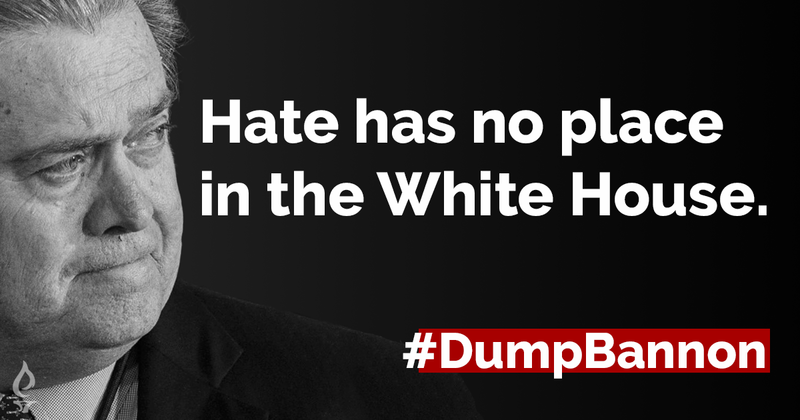 This hate has shown itself in the offensive nature of the Trump campaign and in the White House’s early efforts to ban Muslims and refugees, tear apart immigrant communities, roll back protections for transgender students, deny access to birth control and re-ignite the War on Drugs – but that is still only the tip of the iceberg of what a Bannon White House will try. Bannon’s removal from the National Security Council was an important step toward de-politicizing our nation’s security apparatus and he should also be removed from the White House entirely. Bannon is of no governing use. Bigotry and fear-mongering may win some votes but, as has been evident throughout the inauspicious start of the Trump presidency, they are ineffective governing strategies. This news release is from April 14, 2017 and was sent by Scott Simpson, scott@muslimadvocates.org, 202.735.1984.